No more deadlines. 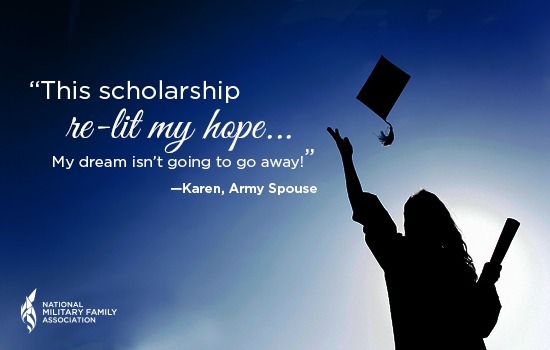 Military spouses can now apply for scholarships throughout the year to support their educational and professional advancement. ALEXANDRIA, VA—The National Military Family Association (NMFA), a nonprofit that works to strengthen military families, is now accepting applications for its Military Spouse Scholarships program on a year-round basis. Military spouse Emily Yancey knows that sacrifice. As caregiver to her husband, who is 100% disabled from military service, Emily has often put her own ambitions aside to meet her family’s needs. Emily received a scholarship from NMFA and pursued a certification in culinary arts. She now has a career that enables her to contribute to her family. With the new, rolling deadline, NMFA’s scholarships will be awarded to spouses like Emily throughout the year. NMFA’s Military Spouse Scholarships can be used for a variety of educational and professional advancement opportunities, including degrees, certifications, licensures, CEU’s, professional exams and other related expenses, such as fingerprinting and background check fees, and more. Military spouse business owners can also apply for funding. Scholarships can be used for direct sales buy-ins, inventory and merchandise, business marketing, branding, manufacturing, supplies, permits, or additional entrepreneurial pursuits.